In December 2012 Wessex Archaeology was asked to prepared a Historic Building Record on behalf of Skillingtons, through Donald Insall Associates. Westminster Hall is part of the Palace of Westminster and is listed Grade I. In December 2012 Wessex Archaeology was asked to prepared a Historic Building Record on behalf of Skillingtons, through Donald Insall Associates. Westminster Hall is part of the Palace of Westminster and is listed Grade I. It was built for William II in 1097-99 and was the largest Hall in England measuring 73m x 20m in plan. 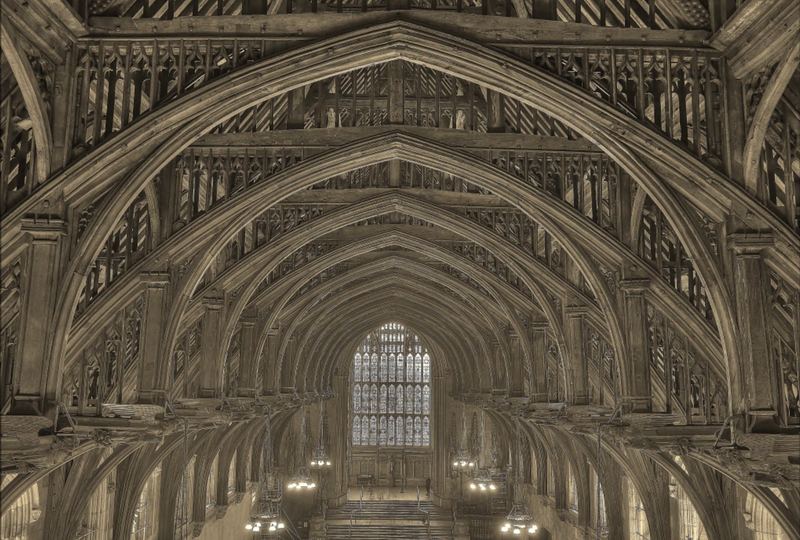 The hammer-beam roof was commissioned by Richard II in 1393 and is the largest medieval timber roof in Northern Europe. The Hall has been subject to several major restoration works since the 1740s. These include the replacement of the lead roof with slate and steel supports added to the roof timbers. The Hall survived both the fire that destroyed the House of Lords and House of Commons in 1834 and bomb attacks in the Second World War. The archaeological building survey provides an accurate long-term record of the location and detail of the mason’s marks, in order that future researchers might build a picture of the number and identity of mason’s who worked on the building, and make comparisons with similar marks from other buildings. Conservation work within Westminster Hall to clean and repair the north wall stonework would result in damage to the mason marks in this area as the masonry surface is friable. Loss of depth, clarity and legibility of the mason’s marks and tooling details was a concern. The upper part of the internal elevation of the north wall of Westminster Hall was the subject of a programme of detailed archaeological recording prior to cleaning and repair of the stonework. Rectified photography located the mason’s marks and other details on existing survey drawings. Detailed photography was taken of individual mason’s marks and examples of tooling. A selection of the mason’s marks were drawn metrically from the scaled photographs.